Low emission development: What’s in it for Africa? In our new short film, African climate and development experts present the need for low emission development strategies in Africa. What does low emission development mean in an African context? As countries and businesses in Africa draw up plans for social and economic development, how can these be made consistent with climate goals? 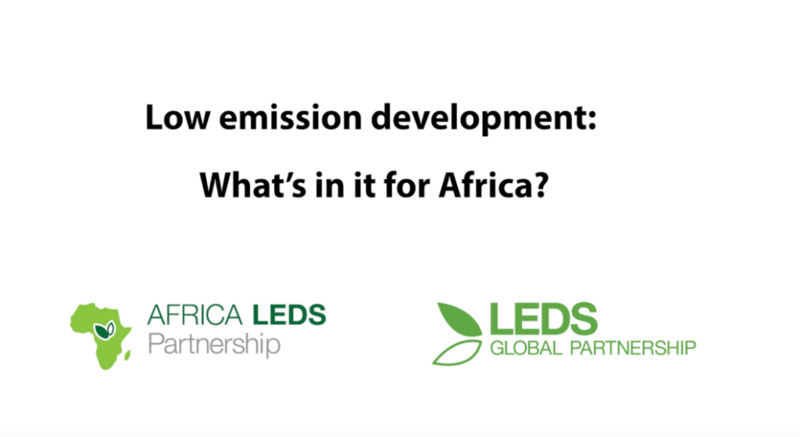 A new short film from the LEDS GP and the Africa LEDS Partnership explores how low emission development can help to bridge the gap between emissions reduction commitments and development goals in Africa. In the video, African experts highlight major opportunities for both businesses and governments. increased floods, droughts and natural disasters. Achieving sustainable development in the face of these challenges requires an integrated approach from diverse sectors. Low emission development in Africa isn’t only about mitigation actions and reducing emissions, it’s about adaptation and resilience too. In the film, speakers look at how low emission development strategies can help forge solutions that avoid emissions and are also climate-resilient: such as renewable energy mini-grids that support rural electrification. Mini-grids are typically less vulnerable to climate change impacts such as extreme heat and sea level rise, than large scale power plants and their transmission networks. “Low emission development to us in Africa means that we are actually trying to reduce the effects of climate change to our society,” says Dr. Victor Osu, Rural Electrification Authority, Nigeria. “If Africa is developing then it has to go on clean energy, clean electricity production, clean water, clean sanitation and everything” – John Yeboah, Principal Programme Officer and Biomass Expert, Ghana Energy Commission.